When anyone tells me about the lack of need for organized labor, I always tell them to find me a better way to reduce income inequality in our society, or find me another way that helps those of us outside of the top 5% get our share. They can't, of course, because none of their ideas work in practice. Or their ideas work exactly as designed, creating massive inequality, lowered wages and poverty. Friendly conservatives who aren't soulless: I'm open to your ideas, just show me examples of them ever working in practice! And if you're cool with the top 5% owning 62% of our country's wealth, that's fine. Just be upfront and embrace the plutocracy you desire. The one thing I hold against government unions is their method of collecting payment. I actually think it is immoral that unions make monetary contributions to political causes and campaigns when the government is the one collecting their money for them. Doesn't that amount to pro-union elected officials taking money and putting it in their own pockets? That is how I view it. How do you? That is really the only problem I have with unions. I guess union wages and minimum wage create a black market for low wage work, but I haven't figure out a way around that one. As far as the current distribution of income goes, if I am reading that right, the average top 10%er is making 9 to 10 times more money than the average bottom 90%er. So maybe 40,000 vs 400,000. 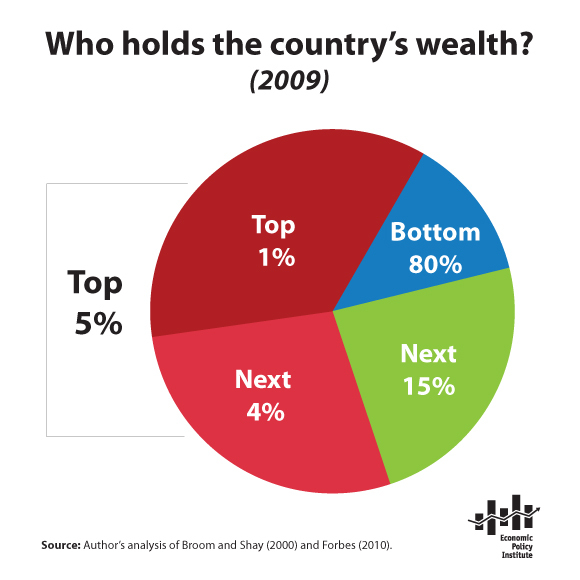 It makes sense that the top percentages would hold proportionally more wealth than the bottom percentages since they would be able to invest a larger percentage of their income. I honestly don't know what is appropriate here. I know some of my friends at school who go into radiology or plastic surgery will be making that much. I honestly don't know what I think should be the case, I don't think I have a good enough grasp on the economics of it to say anything. I know that ideologically I do not like the way our economy is run right now, some mix of corporatism, state monopoly capitalism or whatever you want to call it. I think we differ on how to fix it. Closing the revolving door between regulatory agencies and large corporations is where I would start to try to right the ship. Your description of union dues for public sector unions isn't accurate, and is a misunderstanding I hear a lot. Both private and public sector unions collect dues from their members to cover the cost of running the union (negotiations, research, lawyer fees, workplace health and safety trainings, defending employee grievances, organizing costs). Those union dues that are deducted from your paycheck cannot be used for political contributions. A lot of regulations on dues differ from state to state (agency shop provisions, right to work), but the law on dues being used for partisan political activity is a clear one. For their political work, unions set up political action committees, and members can give to that separately, but it is something different entirely from dues, and is contributing to it is completely voluntary. I'm not sure if this changes your point on public unions, but it does paint a slightly different picture than simply one pool of money exchanging hands every election cycle. 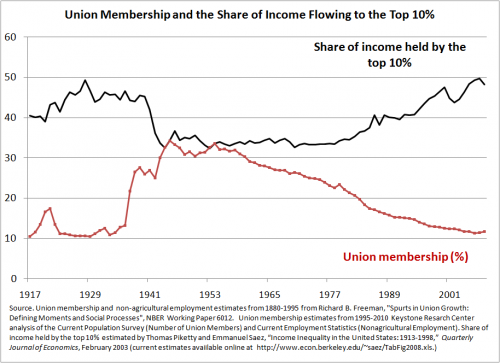 As far as the income inequality stuff goes, here is another good graph that gets into a bit more detail. The problem is that there are nothing but incentives for our our largest and richest companies to reinvest their money places where they don't have to worry about pesky environmental regulations or labor standards. This could be fixed, but their power over those in office and those who regulate them is immense. I couldn't agree more about the revolving door issue, because now we really have the worst of all systems. Not sure how that awful relationship gets broken down, but we've got to start somewhere. Another issue that would help this is tax enforcement. Our tax system now benefits only those who can afford enough lawyers to get around it. I'll have post on that subject soon as well. Also, on the revolving door issue, this article from a few weeks back that we linked to will make your blood boil. Glad I asked you about unions! Thankfully it is a little more nuanced than I thought, I will have to look more into it. Another thing I wanted to ask you is who decides what a fair share is? A lot of people think that capitalism is responsible for the inequality we see today, but we don't have a capitalist system. Like I alluded to earlier, almost every abuse large corporations have committed against the economy and the people of the US has been aided and abetted by the government. I haven't read all the way through the article yet that you gave me but it seems like it is going to be a perfect example. It really does make the blood boil. There are tons of similar examples in the food industry, which is an area I feel especially strongly about. It is my opinion that a truly free market is the only thing that can set wages and prices in a "fair" manner. What do you think? How do you see it being accomplished? I like this thread, sadly i've been away from the blog for the past week or so. Can I promote this to the front page? Sure RB that would be great. Ugh, I just finished that article. Truly depressing stuff. Hey man, don't worry, I haven't forgotten about your questions, I've been thinking and haven't had a chance to construct a meaningful response. Since these are broad far reaching questions, the fair share one being particularly difficult to answer, since it varies greatly industry by industry. What I would say is that this is the reason that I think collective bargaining is so fundamental. When you have the right to engage in negotiations with your employer over work conditions, pay and benefits, it won't always be fair, but at least there's a chance that the two sides can come to a agreement that approaches a fair compensation for the work they've put in. As for the second question about a truly free market setting wages and prices at an acceptable level, I think it would likely cause more problems that it solves. The first problem that I have is that in a truly free market approach to wages, the floors would be dropped, and a race to the bottom effect would the created. This isn't all theory, since before in 1938 we didn't have a minimum wage, and the reason it was installed during the great depression was the existing unregulated wage market created a system that pit worker against worker, seeing who would do a job for the least amount of money, driving their wages far below what it took to survive, much less live a life worth living. It also depends on your priorities, beliefs, and relates back to the "what's fair" question. Personally, I believe that anyone who works a full time job (no matter the job), deserves to make a salary that allows them to buy food, shelter and health care. This is known as a living wage, and would be a substantial increase on the minimum wage, and be pretty far from the free market approach, but it's more important to me that someone who works a full time job be able to live out of poverty than anything else. Once we achieve that we can work backwards on how to figure out the rest. I know the arguments against it would be related to smaller businesses, and the impact it would have on small firms that can't afford it. In that case I would argue the government could subsidize the wages of employees at firms with less than x emps, to not run them out of business, but make sure that standard is reached elsewhere. At the larger firms, the majority of them could afford this now if they wanted, and if they put caps on CEO compensation, making sure it couldn't be more than a certain % of revenues. I realize all these ideas are pretty far away from the free market for wages idea where we started, but there you go I guess! This of course doesn't even get into the impact of the purely free market philosophy for environment regulations, health regulations, and other things that would follow this approach, but I've gone on too long. The concept of a free market is literally meaningless in the context of an economy where corporations are often larger than governments.